The Gar-Box™ is America's Ultimate Humidor, made from a U.S. military reclaimed 50-caliber ammunition box and lined with high-quality, ¼-inch Spanish Cedar. The Gar-Box™ humidor includes a premium, removable brass hygrometer and a DryMistat® Humidification Device. Gar-Box™ is at home on outdoor adventures or in a poker room in the swankiest estate. The combination of an airtight gasket and a premium humidification device provides a perfect seal and moisture source, keeping your cigars fresh and far from drying out. The Gar-Box™ will become the envy of your friends and a prized possession for years to come! Our entry-level Private is our most portable and affordable model for enjoying your cigars on the go. It's lined with 1/4-inch Spanish Cedar and fitted with a DryMistat® humidification device. Our original model, the Sergeant is larger than the Private and adds a removable brass hygrometer to help maintain the perfect moisture level at all times. Our most popular humidor! The Captain has the same great features as the Sergeant, but adds a shelf for your favorite lighter, cutter, and other tools. Same box, but with more function for the true cigar aficionado. KickAss™ waterless, lemon-scented work wipes are exactly what you need to clean even the dirtiest surfaces. Powerful: These wipes cut through the toughest tar, grease, wax, ink, paint, lubricants, and adhesives. Versatile: They can be used for nearly any job, from wiping hands to cleaning machinery. Gentle: They're infused with a special balm so they won't crack or dry your hands. Strong & Safe: The rough side scrubs without scratching, while the soft side wipes surfaces clean. Specially Formulated: They dry without leaving a residue. Available In Multiple Sizes: Choose the one that best meets your needs. Our 20 and 70 count canisters are ideal for portable use. Keep them around the house, in the garage, or throw them in your truck to clean up on the move. Our Big 400 Count Bucket is a must-have for auto shops, machine shops, and other any place where you work hard all day and get dirty every day. KickAss Glass Wipes™ are the fast and easy way to clean your windows, mirrors, light fixtures, windshields, display cases, doors and glass tables to keep them looking crystal clear. Our 400 count bag was created specifically for refilling and reusing your big bucket, but it can also be used to refill our portable canisters or in your own dispenser. The UCL Truck Bed Kit includes everything you need to easily install helpful LED lighting in your pickup truck, with or without a tonneau cover. The UCL Trailer Lighting Kit provides a blast of super-bright LED light for enclosed hard trailers or canvas trailers with an aluminum frame. 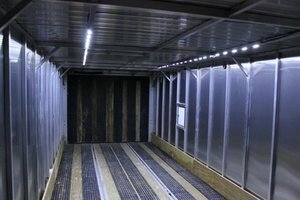 Light up the interior of your box truck or semitrailer for easier loading, unloading, transporting and delivering any time of day. The Shed Lighting Kit is an easy way to add light to your outdoor storage shed. Kiss those stubbed toes and scraped knees goodbye forever! The UCL Boat Kit extends your time on the water and makes your evening or early-morning boating more fun and safe. Illuminate the inside of your gun safe or cabinet, and add a touch of class your collection deserves with our safe lighting kits. Our deluxe, full-snowmobile lighting kit creates an awesome glow effect under the hood, through the engine vents, and above and around the track. Featuring durable, weatherproof light pods, our hood-only snowmobile kit was made to survive the toughest conditions nature can throw at you. With the same great components and features as our other snowmobile kits, this track-only kit is our most affordable way to deck out your sled.